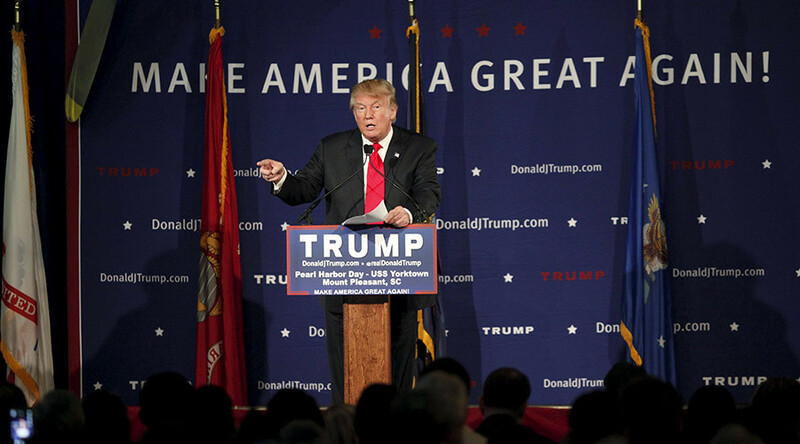 Republican presidential frontrunner Donald Trump called for a “total and complete shutdown of Muslims entering the United States” on Monday. Reactions ranged from outrage to speechlessness. Additionally, Trump clarified that even American Muslims abroad would fall under his proposed plan. When The Hill asked whether Muslim-Americans would be included, Trump spokeswoman Hope Hicks replied by email, "Mr. Trump says, ‘everyone’." There was more demagoguery than detail in the Trump policy announcement. Without referring to how the plan would work, the statement did briefly imply when the travel ban would be lifted, saying it would continue "until our country's representatives can figure out what is going on." To back his claim that Muslim immigration is dangerous, Trump cited the Center for Security Policy, a think-tank founded by Frank Gaffney, a former Pentagon staffer under President Ronald Reagan who has been shunned by both conservative and liberal groups for anti-Muslim conspiracy theories. A survey by the center found 51 percent of American Muslims agreed they "should have the choice of being governed according to Shariah," which, like other religious codes of law, is interpreted in vastly different ways, especially in the US. Trump’s statement says Shariah "authorizes such atrocities as" murder for non-believers, beheadings, "and more unthinkable acts." Dave Weigel of The Washington Post tweeted that Ibrahim Hooper, National Communications Director for the Council on American–Islamic Relations, responded, "Where is there left for him to go? Are we talking internment camps? Are we talking the final solution?" Last week, following the domestic terrorism attack in San Bernardino, California, Trump referred to the event as an “Islamic disaster.” One of the attackers, Tashfeen Malik, had come to the US on a K-1 “fiance visa” to marry the other attacker, Syed Farook. Together with the Syrian refugee crisis and the attack in Paris last month, fears over terrorism are more heightened. A post-Paris attack Washington Post-ABC News poll found that 83 percent of registered voters believe a terrorist attack in the US is likely, up from 73 percent in a pre-Paris attack Quinnipiac University poll. In September, the Public Religion Research Institute found that 56 percent of Americans believe “the values of Islam are at odds with American values and way of life,” which is up from 47 percent in 2011. Cruz on Trump proposal (to NBC): "That is not my policy. I believe the focus should focus on radical Islamic terrorism." The rest of Trump’s main 2016 competition responded either with criticism or a highlight of their own preferred policy. "This is the kind of thing that people say when they have no experience and don't know what they're talking about,” New Jersey Governor Chris Christie told talk radio host Michael Medved following Trump’s announcement. "Everyone visiting our country should register and be monitored during their stay as is done in many countries. I do not and would not advocate being selective on one's religion," Dr. Ben Carson told Fox Business.